The Memorial Park Conservancy is sending its $3.2 million unfinished master plan for Memorial Park to the Houston City Council’s Quality of Life Committee on Wednesday, March 25. The plan is so far a gaudy, overstuffed mish-mosh of bad, hazy, contradictory, wrong, and incomplete ideas developed apparently with the main goal of spending some $200-300 million, half of it public money. The committee should reject this tacky, impractical document and consider directing hundreds of millions of dollars towards the purchase of new parkland instead. We were stunned. Reasonable people would assume that “altered” meant channelized, dug up, scraped, engineered, rebuilt, etc. by humans or machines. In fact, the bayou flowing past Memorial park is one of the last unaltered stretches remaining in the city. But no, “altered” in this case means “changed over time,” explains Shellye Arnold, executive director of the park conservancy. The bayou has adjusted to increased water flows from increased runoff due to development and paving; therefore the bayou is “altered,” says Arnold in an email. The conservancy is developing the ten-twenty-thirty-year plan with the Houston Parks and Recreation Department and the Uptown TIRZ 16, which is funneling our tax money into the blinged-out project. It’s not clear who is in charge of the master plan, or even who is now in charge of Memorial Park, for that matter. 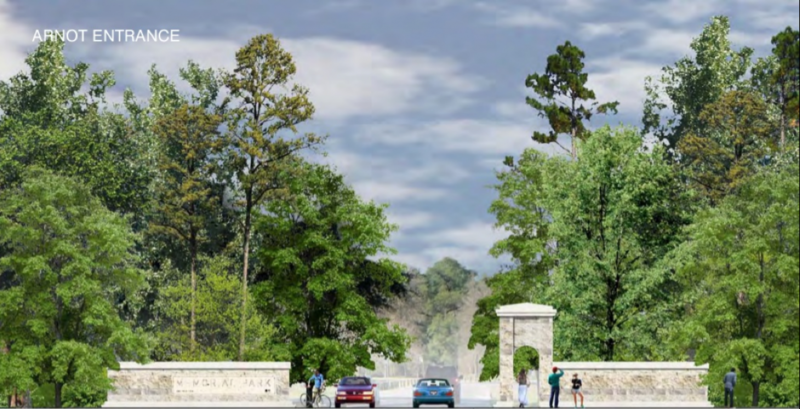 Central Texas limestone entryway proposed for Houston’s Memorial Park. 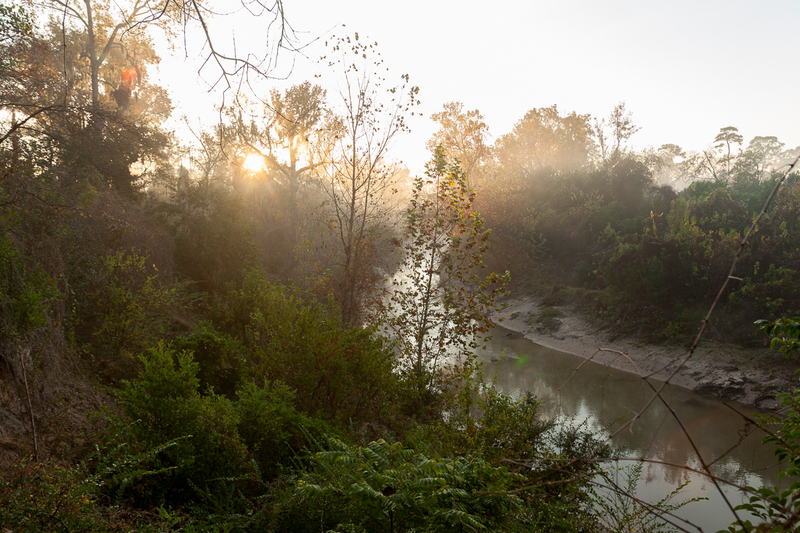 Image from Memorial Park Conservancy. Looking over Buffalo Bayou from Memorial Park towards the River Oaks Country Club. This area is targeted for destruction by the $6 million Memorial Park Demonstration Project. Photo by Jim Olive. 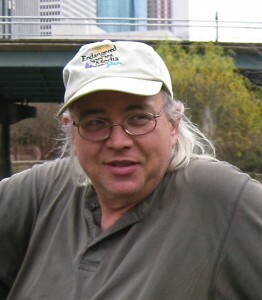 Longtime environmentalist and defender of Buffalo Bayou Frank Salzhandler died unexpectedly last month at his home in Houston’s Cherryhurst neighborhood. He was much too young. Frank was a respected activist and the founder in 1989 of the Endangered Species Media Project, a nonprofit organization that graciously sponsored Save Buffalo Bayou before it became an independent nonprofit last fall. 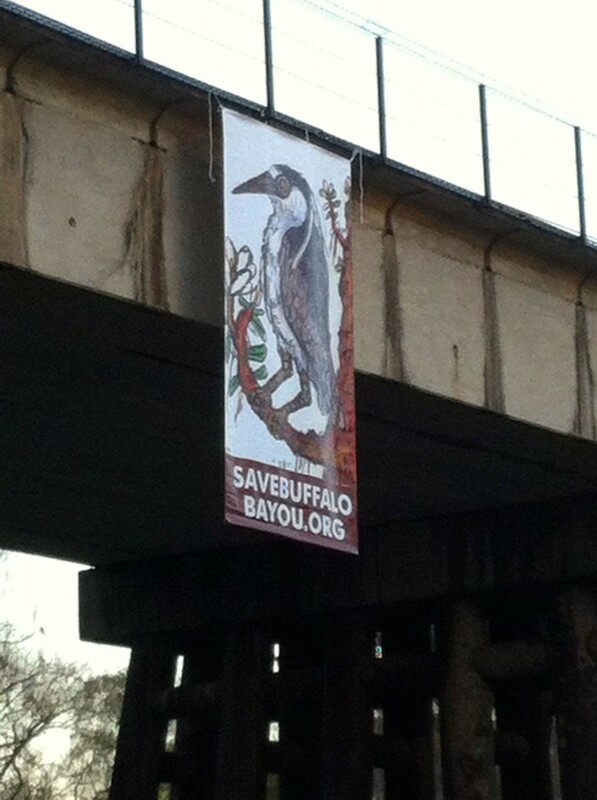 Among its many important projects, in 2010 the Endangered Species Media Project commissioned Houston composer Brad Sayles and the River Oaks Chamber Orchestra to create a symphony for Buffalo Bayou. We offer this opportunity to listen to the River Oaks Chamber Orchestra playing the lovely Buffalo Bayou Suite in honor of Frank Salzhandler. Listen to the River Oaks Chamber Orchestra playing Brad Sayles’ Buffalo Bayou Suite. Defenders of Buffalo Bayou traipsed through clumps of wild chives and violets on the banks of the bayou Saturday, March 7, in order to hang colorful banners from bridges and trees and set out signs informing more than a thousand participants in the annual Buffalo Bayou Regatta about the grave threat to our wild bayou. Operation Save Buffalo Bayou was a huge success as competitors paddling down the bayou waved and shouted “No bulldozers!” and “Leave it natural!” to members of the Buffalo Bayou defense team sitting on the banks in the project area. Bayou defenders also handed out informational flyers at the end of the race in Sesquicentennial Park adjacent to the Wortham Center downtown and engaged participants and officials in conversation. The regatta was organized by the Buffalo Bayou Partnership (BBP), a non-profit organization in charge of developing the $58 million Buffalo Bayou Park between Memorial Drive and Allen Parkway downstream of the project area. 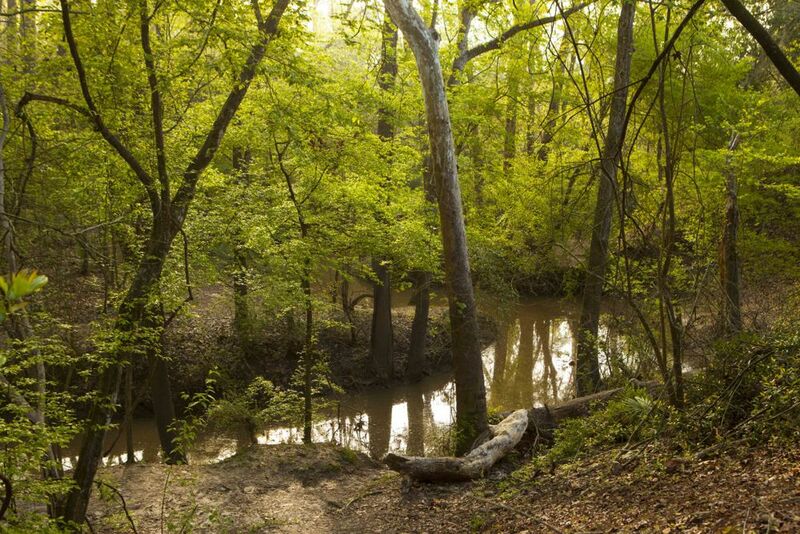 The partnership officially supports the $6 million plan to bulldoze one of the last natural stretches of the bayou as it flows past Memorial Park in the middle of Houston. In fact the amount of silt and sediment contributed by the historic nature area targeted for destruction by the Harris County Flood Control District is minimal. But the project itself would likely greatly increase the sediment flowing downstream as a result of dredging the bayou, removing trees and plants, and breaking up the soil structure of the banks. Beautiful banner of a night heron drawn by Houston artist Frank Tolbert hanging over Buffalo Bayou during the annual Regatta.